Being away from family is not very nice. Most of my family live either in India, UK, US,Europe, Dubai, Canada or Nairobi. That means I hardly ever get the opportunity to celebrate birthdays, anniversaries, festivals with them. Though a disheartening reality, I tend to make the occasions special by making something sweet to celebrate with Ajay. This means that sometimes within a few days I have made something sweet just too often, especially considering Ajay is diabetic. 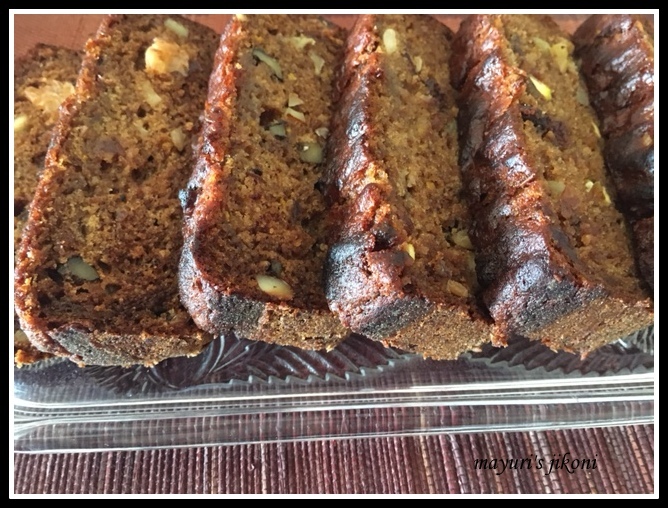 However, I just make the dish and then share it with friends, neighbours , guests and Julius of course 🙂 So, for my dear brother and Arti’s anniversary I made this special eggless fruit cake. Sorry no icing…don’t want to add more calories and not much of an icing person. Ice it if you like. Put the dates and milk in a pan. Heat it over medium flame till it becomes a paste. Let the mixture cool before using it. Preheat the oven at 180°C. Grease a loaf tin 9″ by 4″ with butter and add about a tbsp of flour. Coat the tin with the flour and tap out any extra. Or line the tin with a grease proof paper. Sieve flour, soda bicarbonate, salt and spice together. Add the nuts, raisins and orange peel to the flour and mix it well. To the cooled date mixture add oil, yogurt and sugar mix it well using a hand blender or whisk. Add the flour mixture to the date mixture. Mix gently just enough to coat the flour. Do not over mix. Pour the batter into the prepared tin and bake in the oven for 30 to 35 minutes or until the top is golden brown. To check if its done, insert a fork or toothpick into the middle of the cake. If it comes out clean it is done. If not, lower the temp to 150°C and bake for a further 5 minutes. Remove the tin from the oven. Let the cake rest in the tin for 5 minutes. Gently remove it from the tin and let it cool on a wire rack. Use a bit of all the fruits mentioned above to make up half a cup or use whichever combination you like. Can use vanilla extract instead of orange rind. Do not grate the white part of the rind as it will make the cake bitter. Mixed spice is a combination of cinnamon and clove powder. I also use tea masala sometimes. Can use a round or square tin instead of a loaf tin. Check the cake after 25 minutes. Whenever you bake an eggless cake, leave it in the tin for 5 to 10 minutes to avoid breaking it. Serve with ice cream, whipped fresh cream or custard.